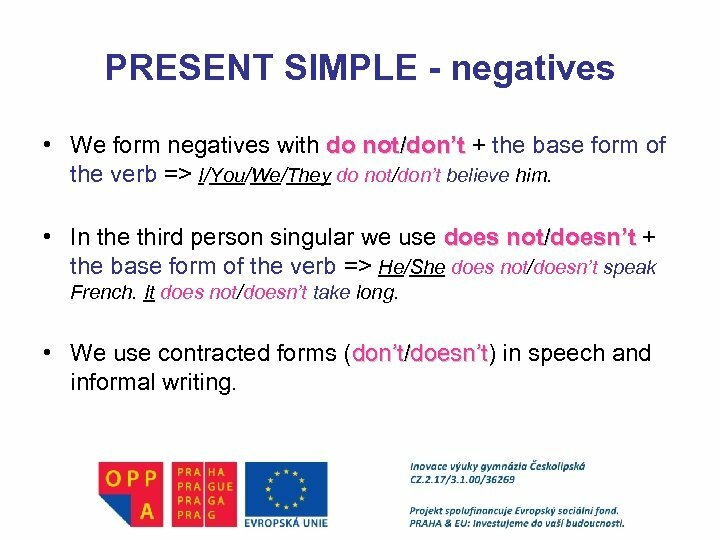 PRESENT SIMPLE - negatives • We form negatives with do not/don’t + the base form of the verb => I/You/We/They do not/don’t believe him. 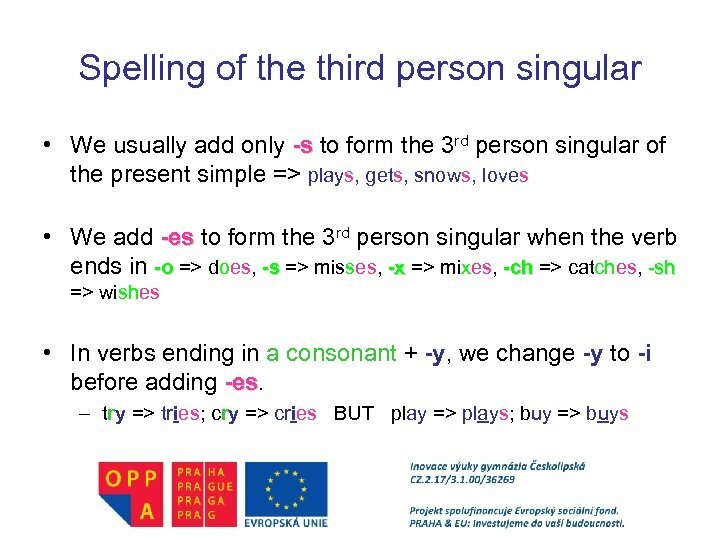 • In the third person singular we use does not/doesn’t + the base form of the verb => He/She does not/doesn’t speak French. 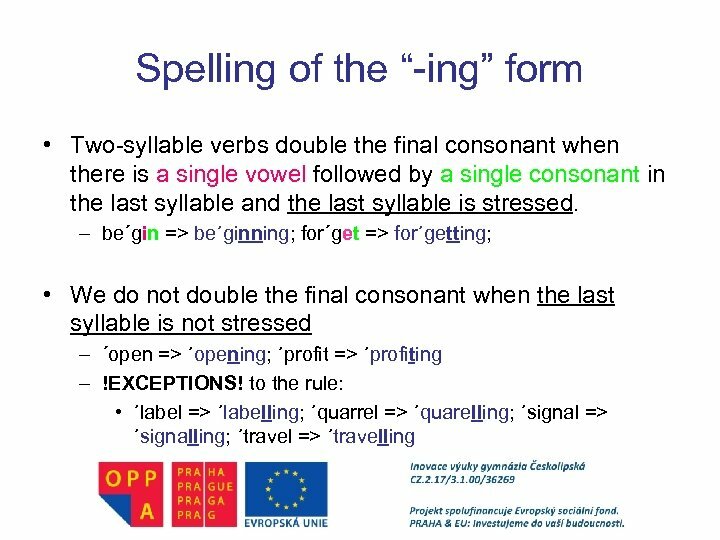 It does not/doesn’t take long. 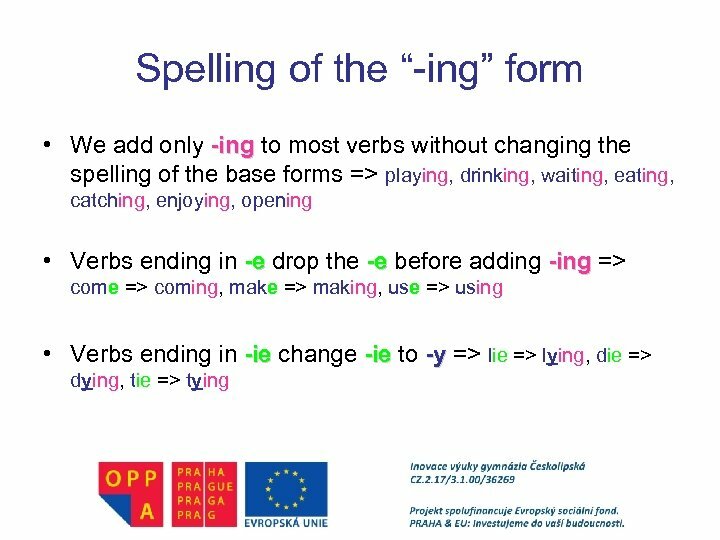 • We use contracted forms (don’t/doesn’t) in speech and doesn’t informal writing. 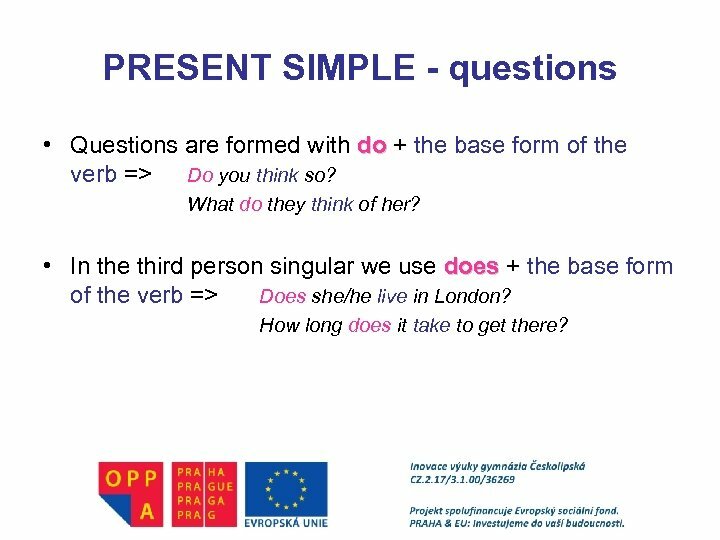 PRESENT SIMPLE - questions • Questions are formed with do + the base form of the verb => Do you think so? What do they think of her? 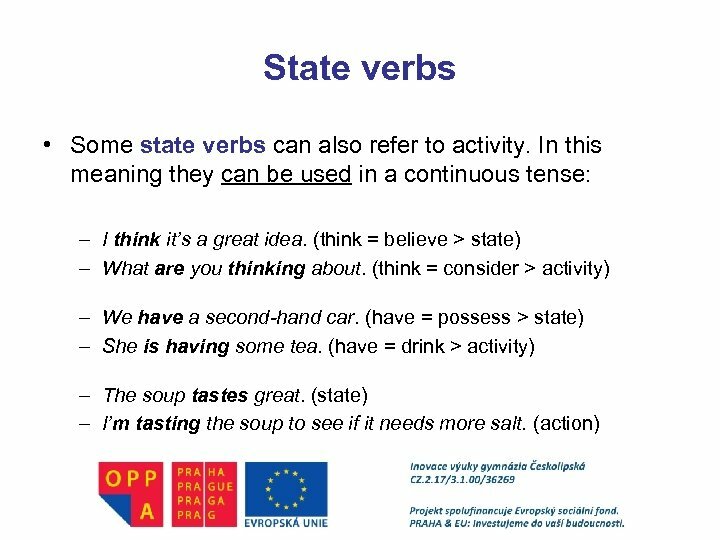 • In the third person singular we use does + the base form of the verb => Does she/he live in London? How long does it take to get there? 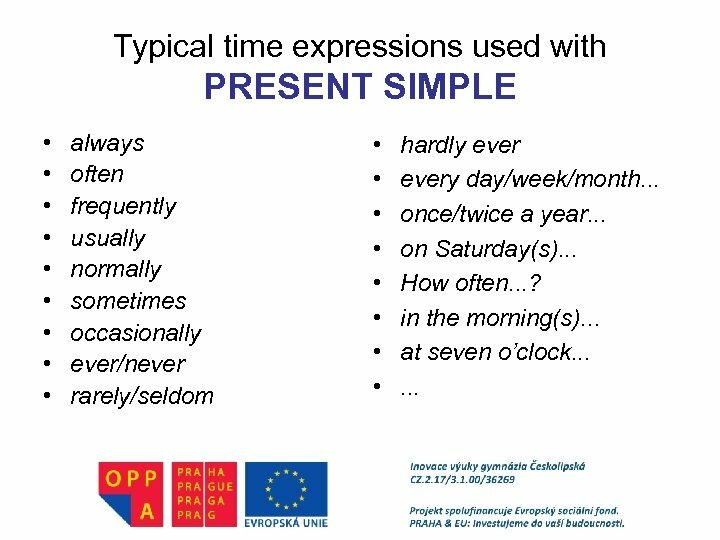 Typical time expressions used with PRESENT SIMPLE • • • always often frequently usually normally sometimes occasionally ever/never rarely/seldom • • hardly every day/week/month. 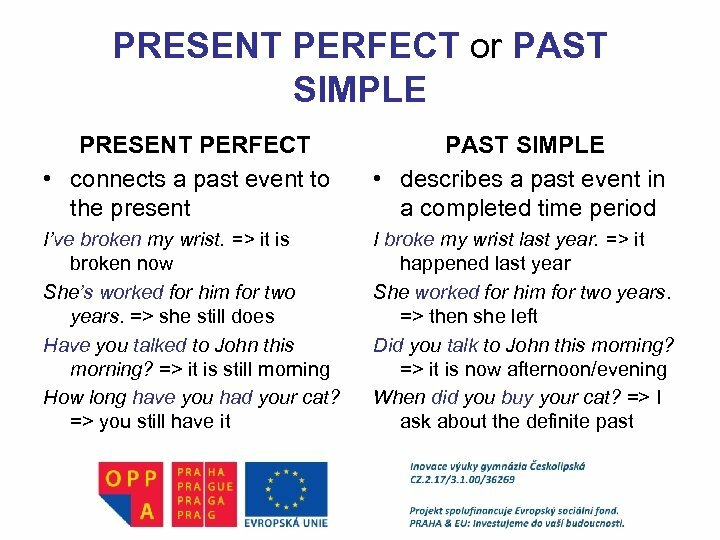 . . once/twice a year. 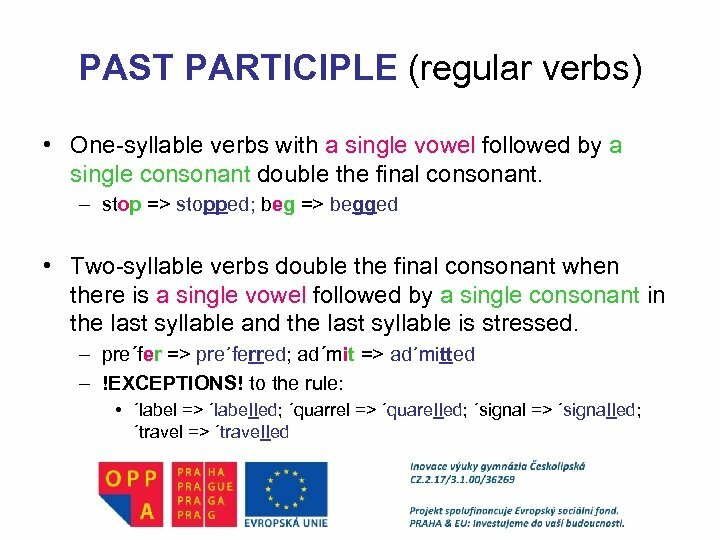 . . on Saturday(s). 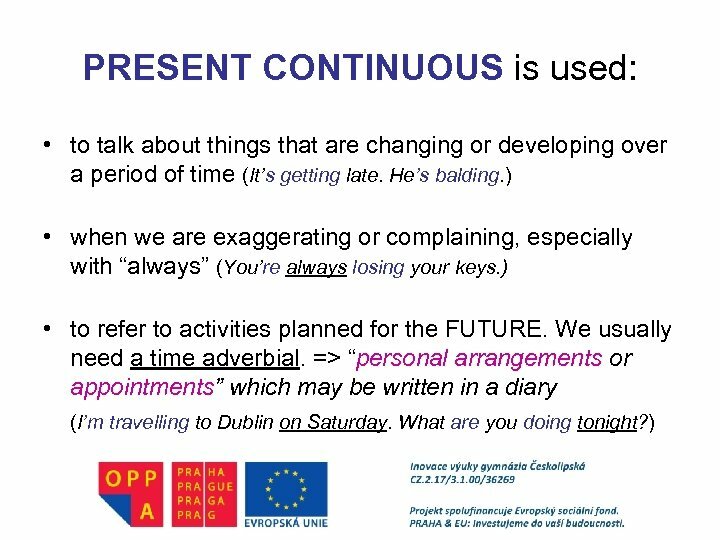 . . How often. . . ? 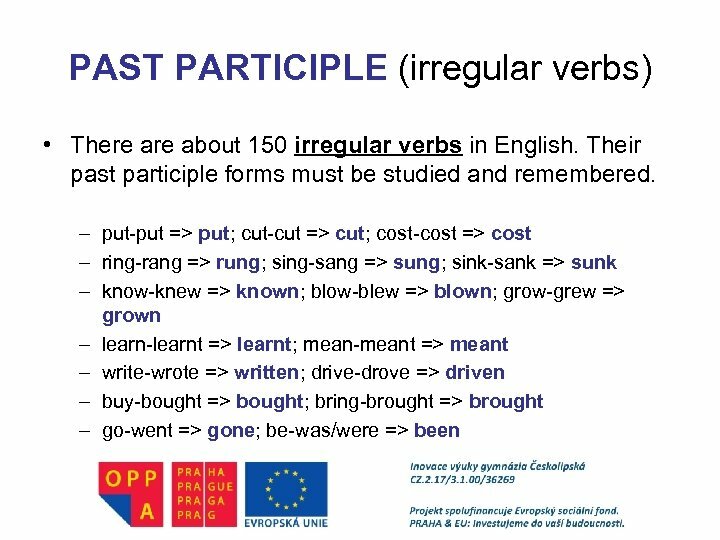 in the morning(s). . . at seven o’clock. . . 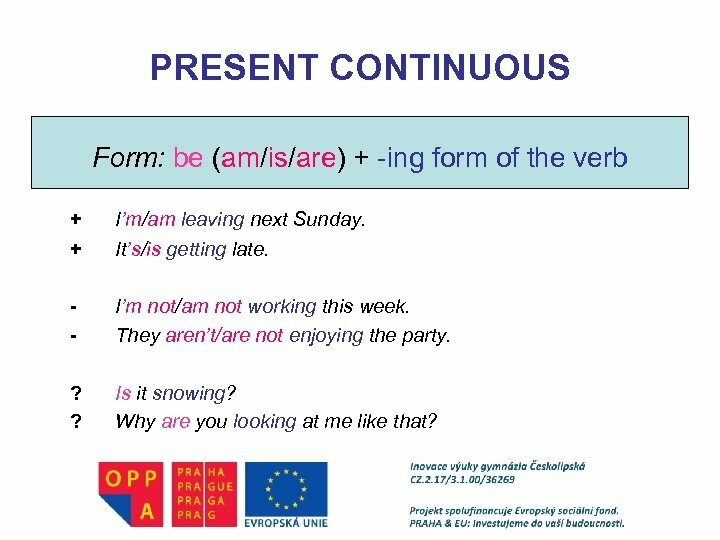 PRESENT CONTINUOUS Form: be (am/is/are) + -ing form of the verb + + I’m/am leaving next Sunday. 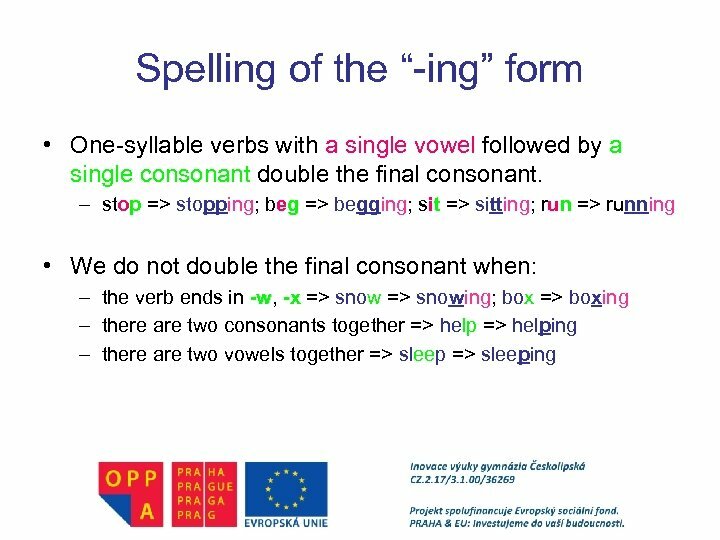 It’s/is getting late. - I’m not/am not working this week. They aren’t/are not enjoying the party. ? ? Is it snowing? Why are you looking at me like that? 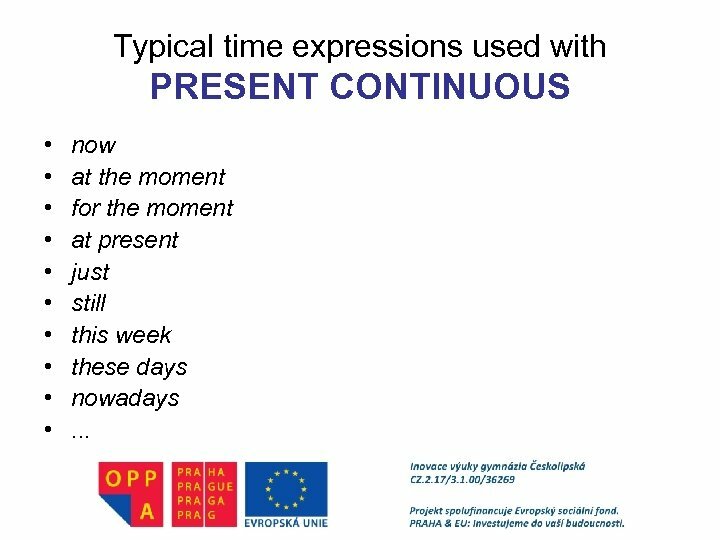 Typical time expressions used with PRESENT CONTINUOUS • • • now at the moment for the moment at present just still this week these days nowadays. . . 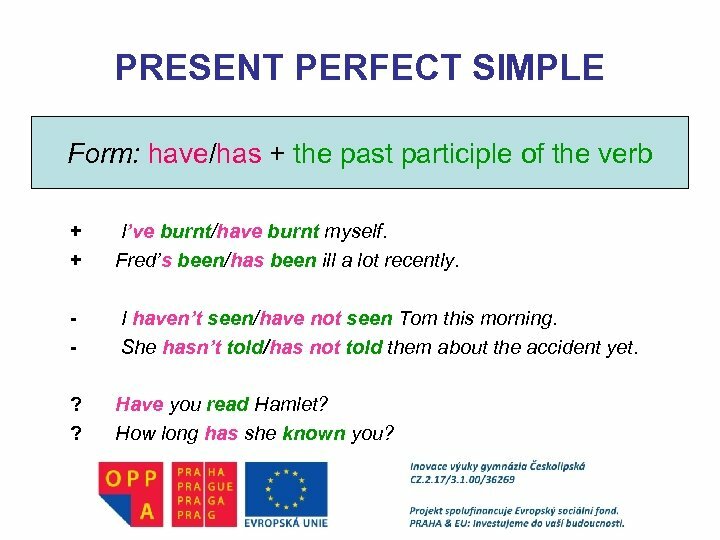 PRESENT PERFECT SIMPLE Form: have/has + the past participle of the verb + + I’ve burnt/have burnt myself. Fred’s been/has been ill a lot recently. - I haven’t seen/have not seen Tom this morning. She hasn’t told/has not told them about the accident yet. ? ? Have you read Hamlet? How long has she known you? 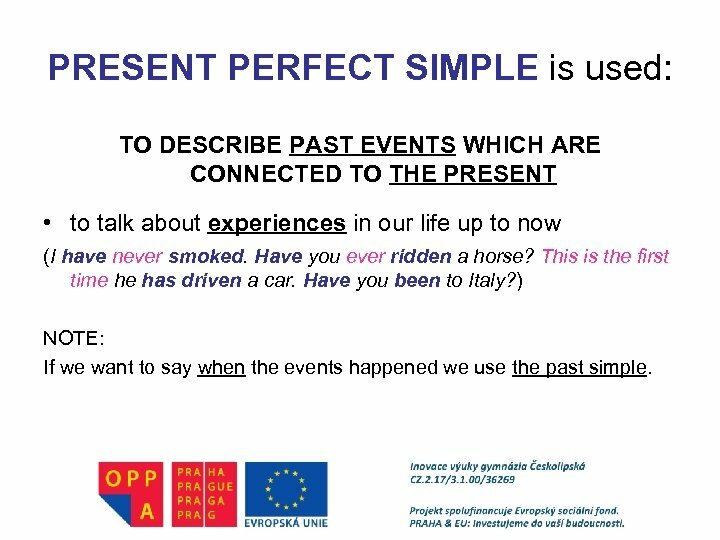 PRESENT PERFECT SIMPLE is used: TO DESCRIBE PAST EVENTS WHICH ARE CONNECTED TO THE PRESENT • to talk about experiences in our life up to now (I have never smoked. Have you ever ridden a horse? This is the first time he has driven a car. Have you been to Italy? ) 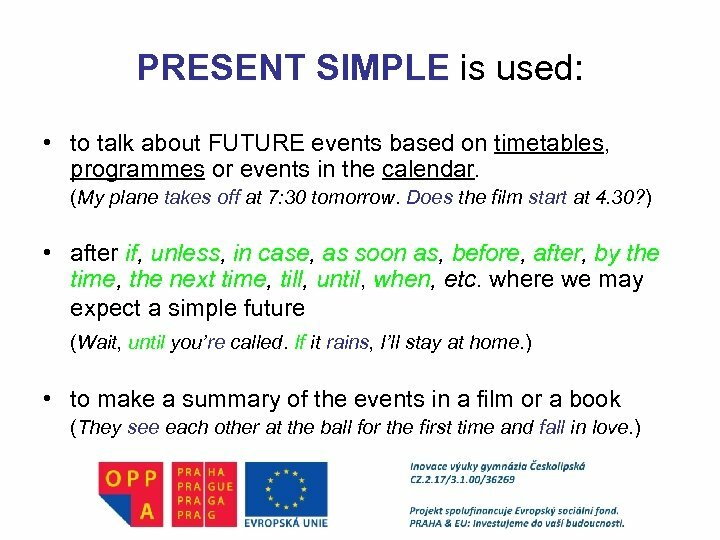 NOTE: If we want to say when the events happened we use the past simple. 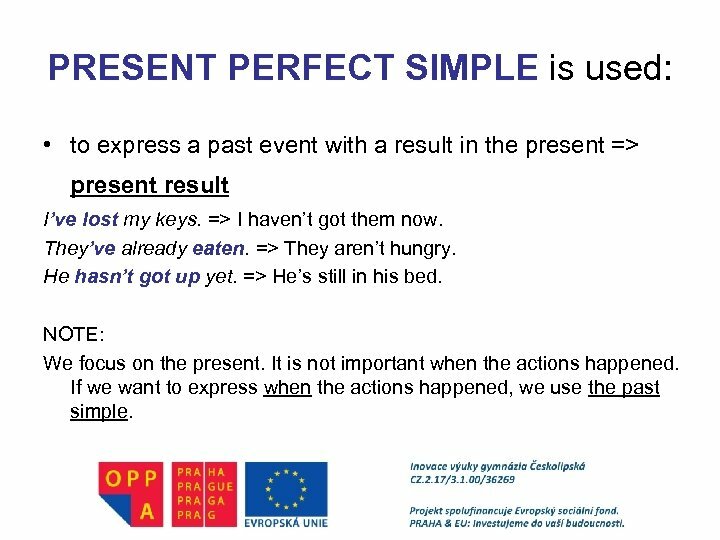 PRESENT PERFECT SIMPLE is used: • to express a past event with a result in the present => present result I’ve lost my keys. 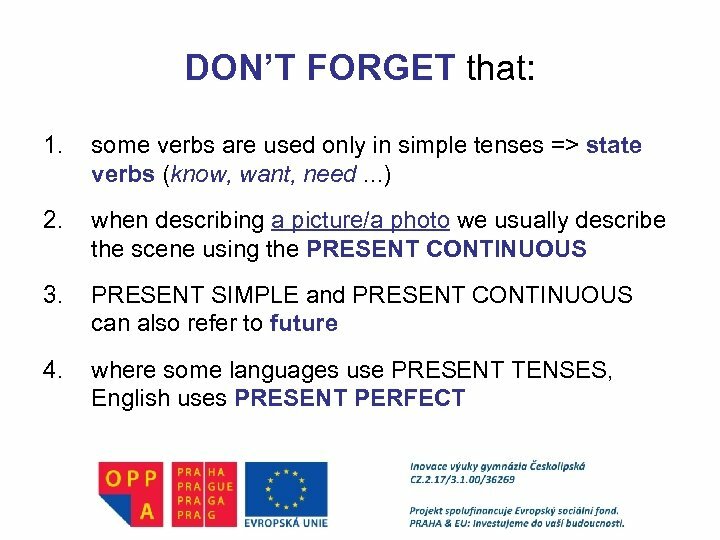 => I haven’t got them now. They’ve already eaten. => They aren’t hungry. He hasn’t got up yet. => He’s still in his bed. 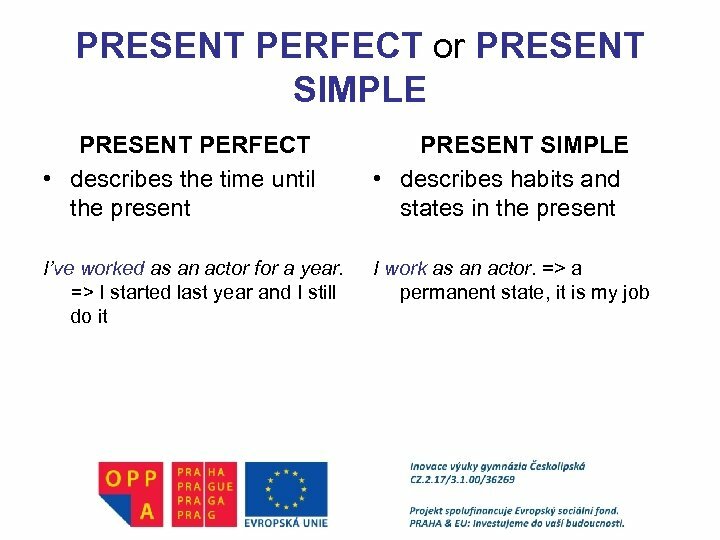 NOTE: We focus on the present. 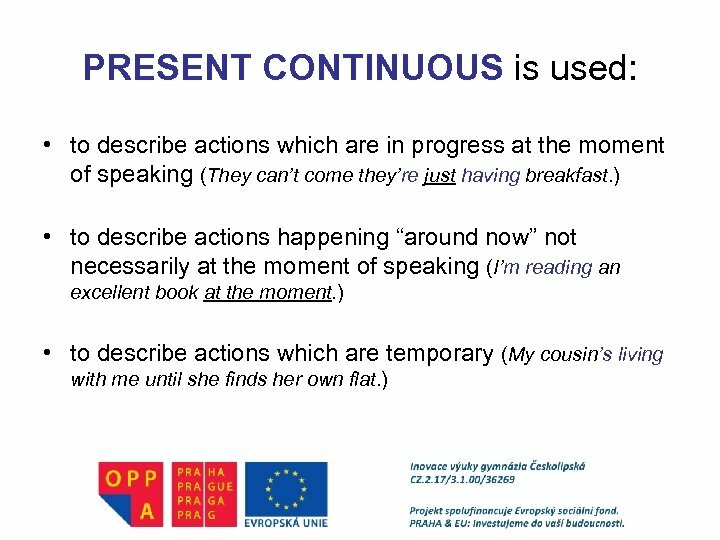 It is not important when the actions happened. 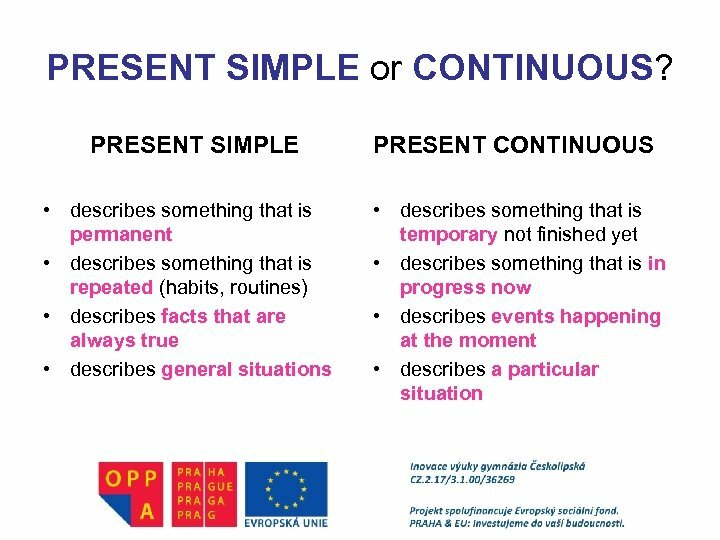 If we want to express when the actions happened, we use the past simple. 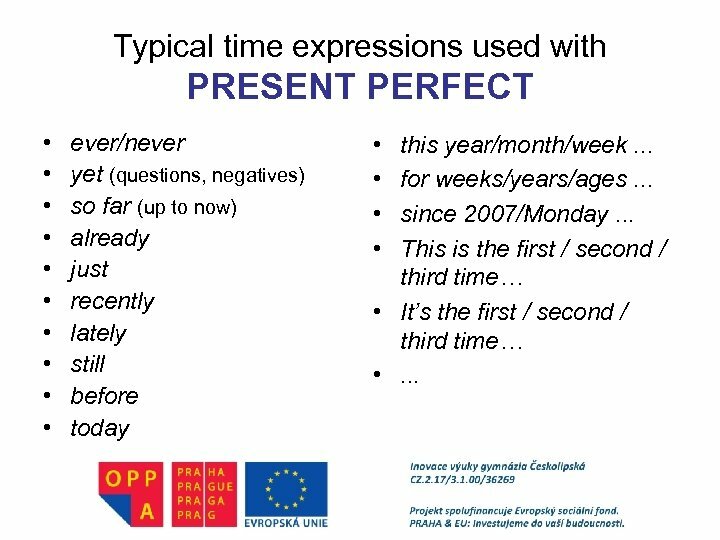 Typical time expressions used with PRESENT PERFECT • • • ever/never yet (questions, negatives) so far (up to now) already just recently lately still before today • • this year/month/week. 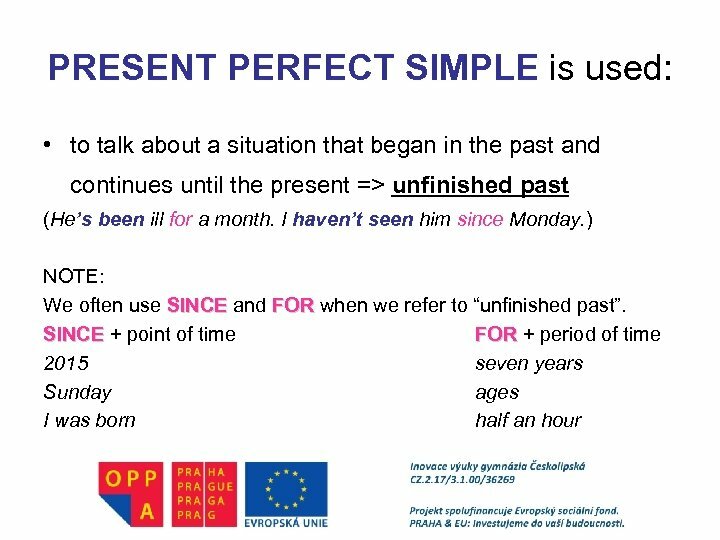 . . for weeks/years/ages. . . since 2007/Monday. . . 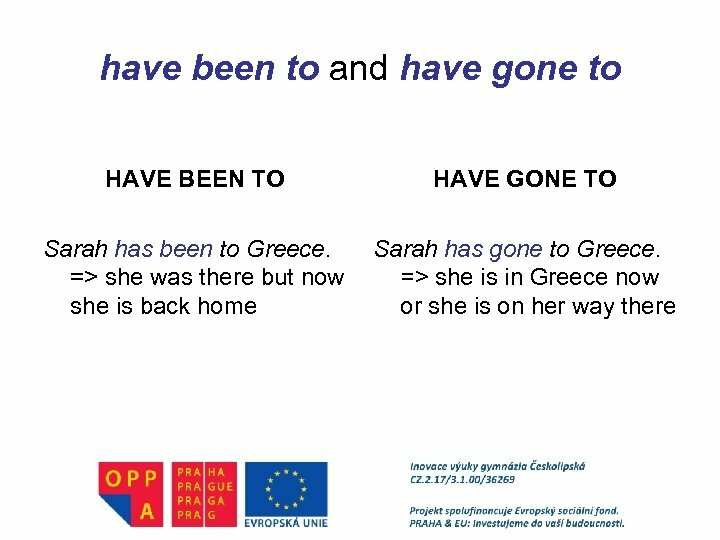 This is the first / second / third time… • It’s the first / second / third time… • . . . 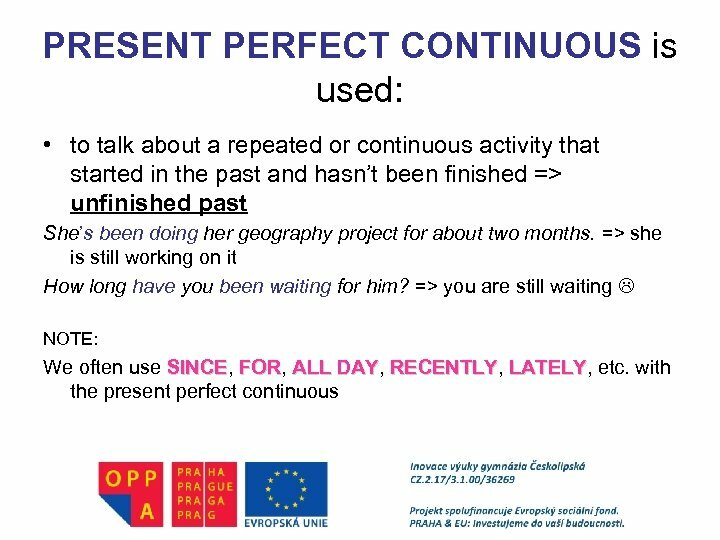 PRESENT PERFECT CONTINUOUS Form: have/has + been + -ing form of the verb + + They’ve/have been waiting here for over an hour. 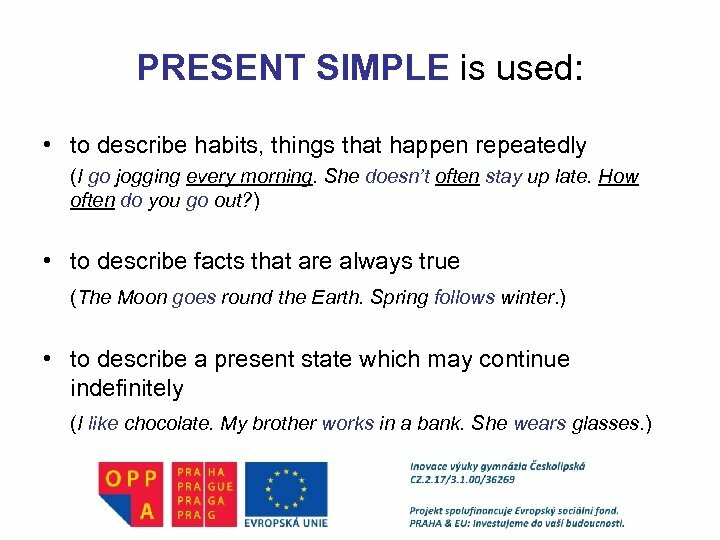 She’s/has been working very hard. - I haven’t/have not been reading much recently. He hasn’t/has not been waiting long. ? ? You’re out of breath. Have you been running? 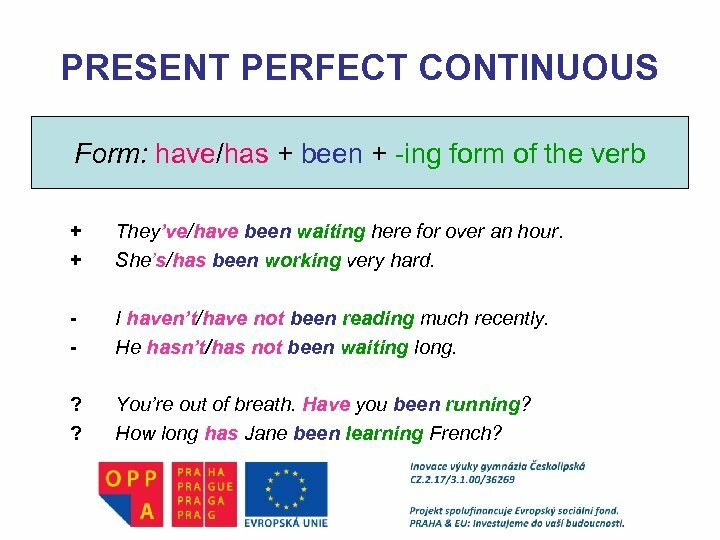 How long has Jane been learning French? 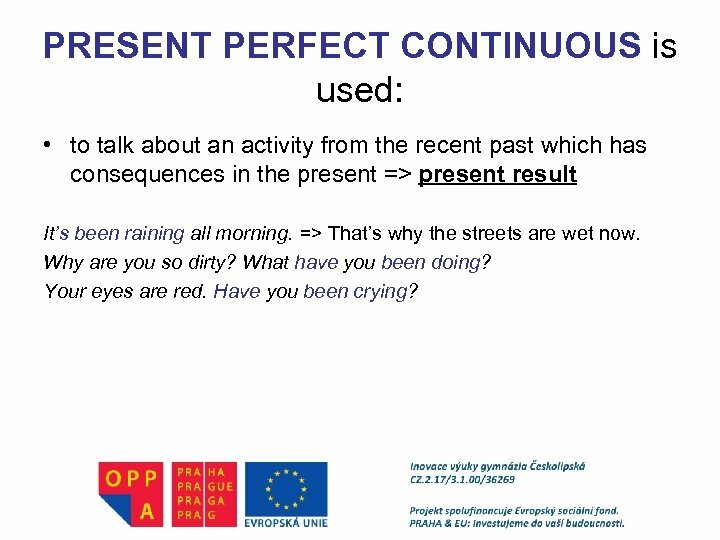 PRESENT PERFECT CONTINUOUS is used: • to talk about an activity from the recent past which has consequences in the present => present result It’s been raining all morning. => That’s why the streets are wet now. Why are you so dirty? 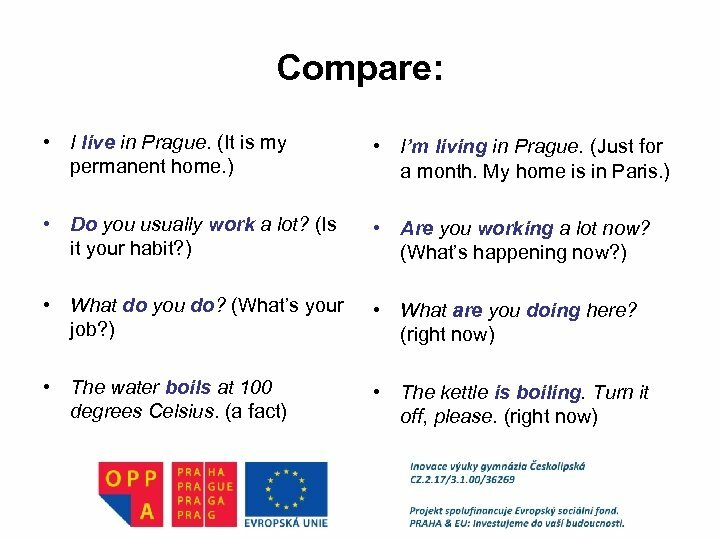 What have you been doing? 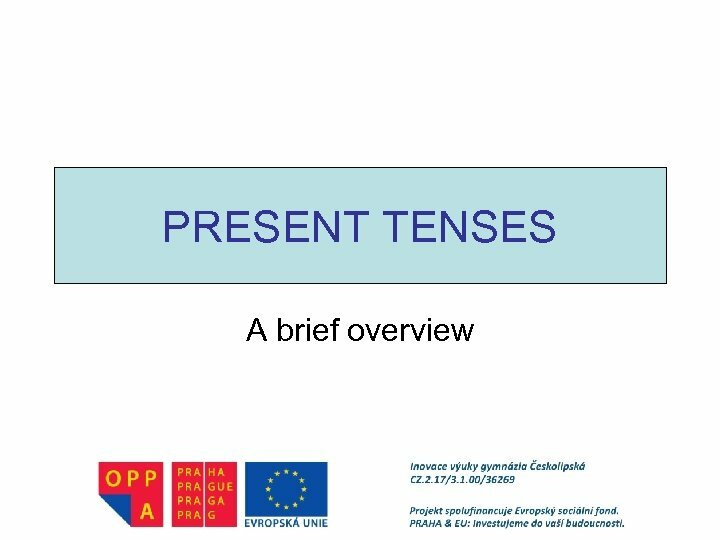 Your eyes are red. Have you been crying? 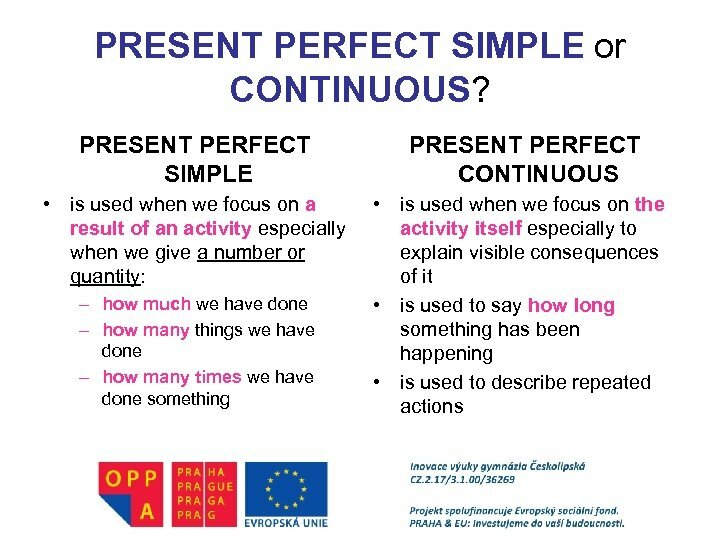 PRESENT PERFECT SIMPLE or CONTINUOUS? 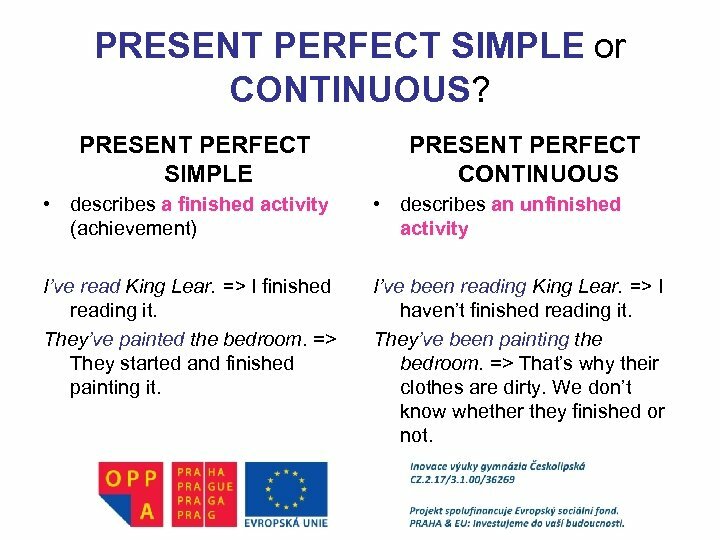 PRESENT PERFECT SIMPLE PRESENT PERFECT CONTINUOUS • describes a finished activity (achievement) • describes an unfinished activity I’ve read King Lear. => I finished reading it. They’ve painted the bedroom. => They started and finished painting it. 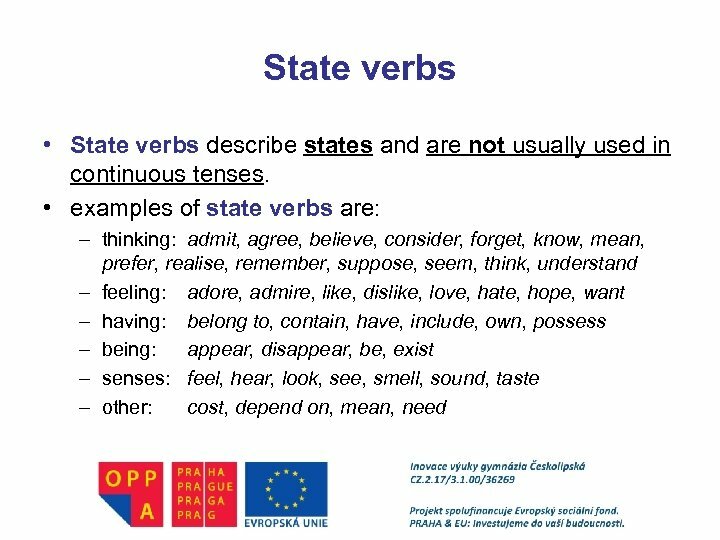 I’ve been reading King Lear. => I haven’t finished reading it. They’ve been painting the bedroom. => That’s why their clothes are dirty. We don’t know whether they finished or not. 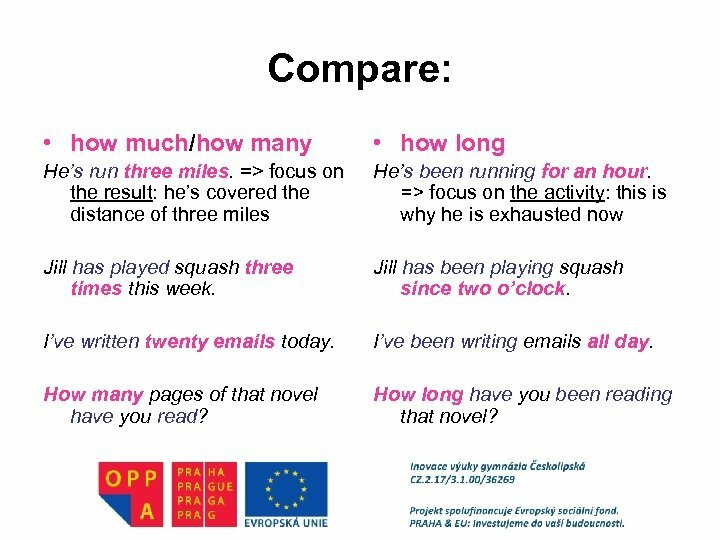 Compare: • how much/how many • how long He’s run three miles. => focus on the result: he’s covered the distance of three miles He’s been running for an hour. => focus on the activity: this is why he is exhausted now Jill has played squash three times this week. Jill has been playing squash since two o’clock. I’ve written twenty emails today. I’ve been writing emails all day. How many pages of that novel have you read? How long have you been reading that novel? 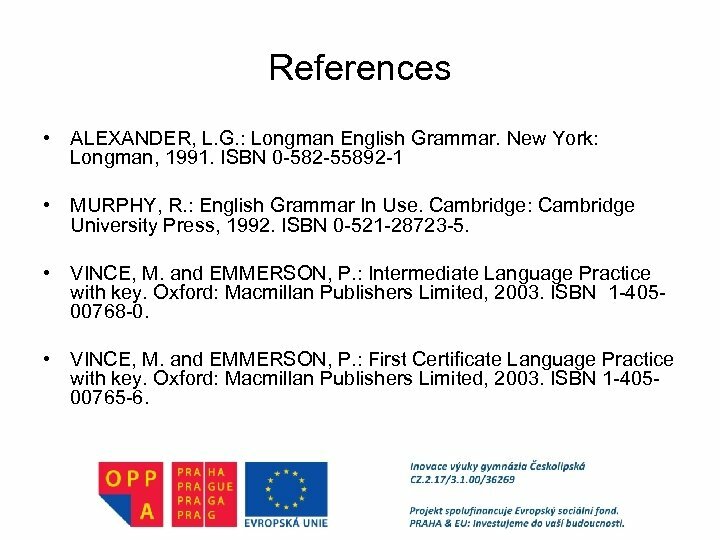 References • ALEXANDER, L. G. : Longman English Grammar. New York: Longman, 1991. 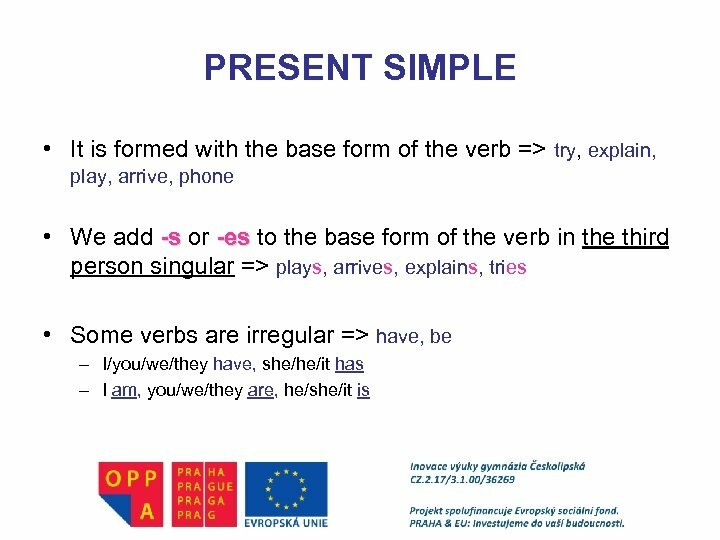 ISBN 0 -582 -55892 -1 • MURPHY, R. : English Grammar In Use. Cambridge: Cambridge University Press, 1992. ISBN 0 -521 -28723 -5. 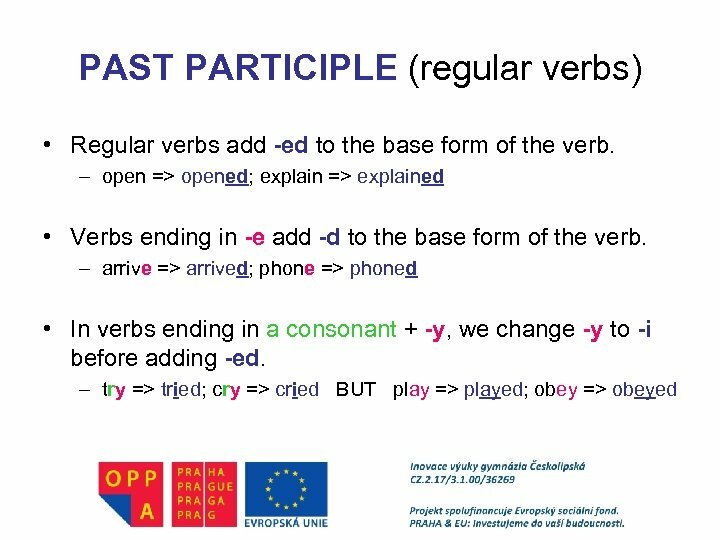 • VINCE, M. and EMMERSON, P. : Intermediate Language Practice with key. Oxford: Macmillan Publishers Limited, 2003. ISBN 1 -40500768 -0. 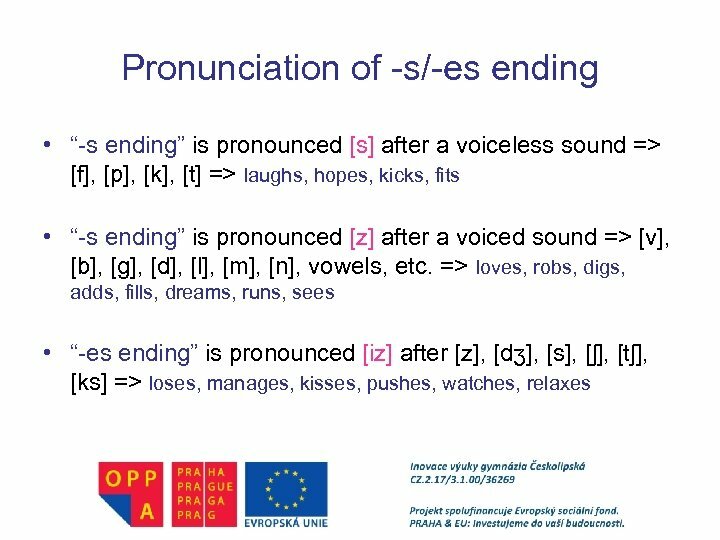 • VINCE, M. and EMMERSON, P. : First Certificate Language Practice with key. Oxford: Macmillan Publishers Limited, 2003. ISBN 1 -40500765 -6.